Congratulations Houston METRO! Posted here is the press release issued by the Metropolitan Transit Authority of Harris County announcing the agency’s digital accessibility initiative. This initiative is the result of Structured Negotiation between the transit agency, whose official name is the Metropolitan Transit Authority of Harris County, and two of its blind riders. The blind riders were represented by Christopher McGreal of Disability Rights Texas, assisted by the Law Office of Lainey Feingold. No lawsuit was filed or needed. Read more about Structured Negotiation, an alternative dispute resolution process that focuses on solution and avoids the conflict and expense of a filed lawsuit. With today’s announcement Houston Metro assumes a leadership role in guaranteeing that all members of the riding public have access to important and timely transit information. 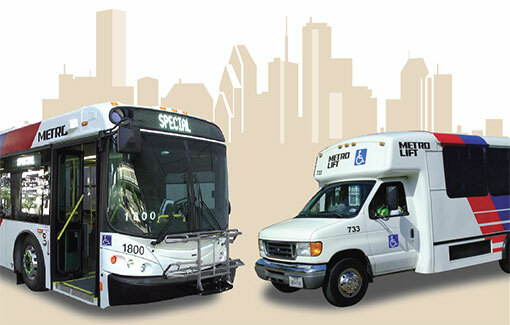 HOUSTON (March 17, 2016) — Consistent with its commitment to all of its riders, the Metropolitan Transit Authority of Harris County (“METRO”) today announced an initiative to make its affiliated websites, mobile applications, and print formation more accessible and inclusive. METRO is taking the lead in the public transportation field regarding online accessibility for individuals with visual impairments. The organization adopted the Web Content Accessibility Guidelines (WCAG) version 2.0 level AA as its accessibility standard and is making enhancements to work toward meeting this standard. METRO will also continue providing braille, large print, electronic, and audio versions of print information to riders with visual impairments upon their request within a reasonable time after the request has been made. METRO worked with blind riders and with Disability Rights Texas, a non-profit legal advocacy agency serving Texans with disabilities, on its accessibility initiative. Lisa Batist is a METRO rider with a visual impairment who worked with METRO on its initiative for riders with visual impairments. George Battiste, a Texas resident who is a regular Houston Metro rider and has been blind since birth, agreed. The WCAG 2.0 guidelines are published by the Web Accessibility Initiative (WAI) of the World Wide Web Consortium (W3C), an international community that develops open standards to ensure the long-term growth of the Web. The guidelines ensure that websites and mobile applications are developed and designed to be accessible to persons with visual and other disabilities. More information is available at w3.org/WAI. METRO is the region’s largest public transit provider, offering safe, reliable and affordable transportation services about 370,000 times per day. METRO operates more than 1,200 buses, and System Reimagining is now underway. For a good picture of where we are headed see our new system map at ridemetro.org METRO is currently expanding its 13-mile Red Line with two new lines under construction. Other METRO services include: Star Vanpool, METROLift, HOV lanes, HOT lanes, Bikes-on-Buses/Trains program, Park & Ride, and road improvement projects. Learn more about METRO, visit ridemetro.org. Disability Rights Texas is the federally designated legal protection and advocacy agency for people with disabilities in Texas. Its mission is to help people with disabilities understand and exercise their rights under the law, ensuring their full and equal participation in society.